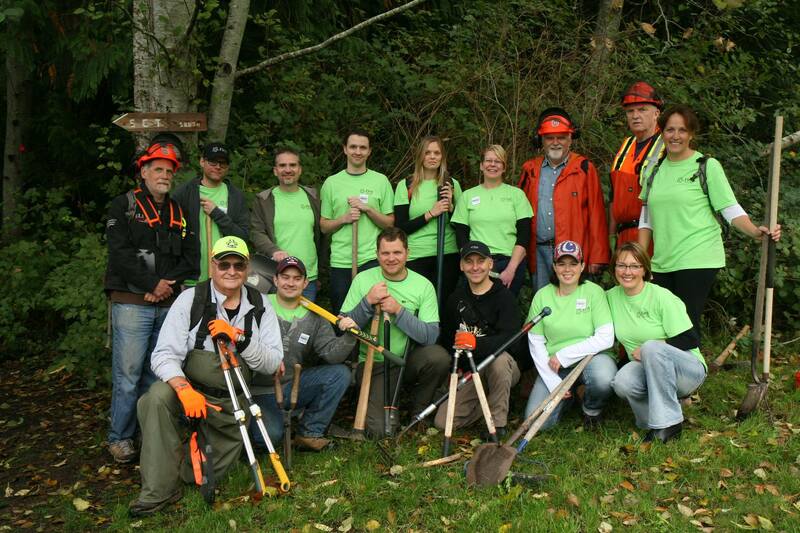 Powell River staff getting ready to help with maintenance on the Sunshine Coast Trail. It was not a decision that was made lightly; on Thursday October 8 First Credit Union & Insurance and Westview Agencies closed early. At 2pm, 140 staff turned off their office lights, loaded their vehicles with shovels, paint brushes, aprons, craft supplies, and scrub brushes, and headed into the community to work as volunteers. What possessed us to potentially inconvenience our members and clients? Why did we decide to close early during an incredibly busy work week? We did it to make a statement – serving our communities is important to us. We did it because we believe in people helping people, and that volunteering is a powerful way to strengthen our communities. We were hoping that our contribution would make a positive difference but we weren’t quite prepared for what we got in return. For 3 hours our staff painted, filed, prepped food, cleared brush, scrubbed, planted trees, cleaned playgrounds, served seniors, weeded gardens, made crafts, and fund-raised for a local food bank. As we came together at the end of the day to share our stories, it was clear that although we’d volunteered for different organizations, we had all shared one very powerful experience – we were bursting with gratitude, happiness, and pride. Grateful to the non-profit organizations who work for our benefit every day; by volunteering we got to know more about them and we were in awe of what they accomplish. Happy to work alongside our coworkers towards a common goal; although we were working hard, we were having fun and the camaraderie was uplifting and energizing. Proud to work for our organization; closing early so that we could volunteer was a bold statement, but one that clearly articulates our values – how wonderful to work for an organization that ‘walks the walk’! We started out wanting to make a positive impact – and we did. But what surprised us was that for that for all the positive energy and goodwill that we gave to our communities that afternoon, we received it all back … and more. Will we host another Community Impact Day? I hope so. Closing for a few hours so that we could volunteer in the community was a powerful experience – one that I would love to be part of again! < Previous Beaufort Children’s Centre to receive a chore busting boost on Community Impact Day!